In a sequestered Manhattan room on the mid-May night of the NBA draft lottery, the ping-pong balls bounced the Cleveland Cavaliers' way and inspired a high-ranking franchise executive to deliver a loud proclamation within a roomful of rivals. "We're never coming back here again!" the Cavaliers official blurted. While this hadn't been the arrogantly delusional boast of a basketball decision-maker, it did speak to an organizational arrogance that surrounded the three-plus lost years under recently deposed general manager Chris Grant. For the second time in three seasons, Cleveland had won the lottery. Only this time, front office executives were mostly relieved that they hadn't been saddled with the No. 1 overall pick in a draft that didn't include a clear-cut No. 1 pick. Beyond selecting Kyrie Irving with the No. 1 overall pick in 2011, Grant made one draft mistake after another. Eventually, he spent his final months on the job calling teams and offering those overvalued young players in preposterous deals for marquee talents. LaMarcus Aldridge. Anthony Davis. Andre Drummond. Eventually, few executives had the inclination to listen to Grant's pitches on one-sided deals. Within months of LeBron James leaving for the Miami Heat as a free agent, there was a belief, fostered within James' inner-circle of Cleveland-based agents and marketers, that the planet's best player could be recruited back in summer of 2014. Through mismanagement and personnel miscalculations, the Cavaliers have made it increasingly improbable that James foresees the storybook ending in Cleveland. In a lot of ways, the elevation of David Griffin to acting GM gives the Cavaliers a chance to make some deals and improve themselves. While league officials loathed dealing with Grant and his non-starter, one-sided offers, Griffin has stronger relationships, excellent player personnel and a leadership track record with the Phoenix Suns that led to him getting two offers – Memphis and Denver – to be a GM. "[Griffin] excels at the trade deadline, so he'll have an immediate opportunity to impress [Cavs owner Dan Gilbert]," an Eastern Conference GM told Yahoo Sports. Nevertheless, Gilbert's plan is to search the NBA landscape for Grant's replacement. Even when few else believed in Grant as GM, Gilbert had long been his most ardent supporter. In the end, it set back the franchise when it desperately needed to reconstruct credibility in the wake of James' departure. The Cavaliers could've had Kyrie Irving and Toronto center Jonas Valanciunas in the 2011 draft class, but Grant balked on using the fourth overall pick on the center everyone else would've selected there. Several reasons factored in, but there had been a strong belief within the Cavaliers personnel department that Grant hadn't scouted Valanciunas hard enough to gain full confidence in his abilities. Cleveland's international scouts raved about the 7-footer, and most of the Cleveland's staff agreed with them, sources said. In the end, Grant wanted Valanciunas' agents to give the Cavaliers a signed buyout agreement with Lithuanian club Lietuvos Rytas that guaranteed the center would join the NBA for his rookie season. His agents at Creative Artists Agency, including Leon Rose, had a reasonable counter, sources said. They wanted the ability to negotiate the buyout once Valanciunas' rookie draft salary had been slotted. And Toronto, with the fifth pick, wanted Valanciunas badly and never demanded the signed buyout as a prerequisite to draft him, sources said. Within the Cavaliers, the belief was that Grant was searching for a way to cross Valanciunas off the list and draft a player that he believed to be a safer bet: Texas' Tristan Thompson. What's more, Rich Paul, James' childhood friend and player agent now, represented Thompson. From there, Cleveland compounded mistake upon mistake. Grant passed on Connecticut center Andre Drummond in the 2012 draft, because he didn't want to pair two such unpolished offensive players as Thompson and Drummond together, sources said. Grant had always warned player agents that the Cavaliers would never a select a player who didn't come and work out for the franchise. Only Grant did just that when he took Syracuse guard Dion Waiters with the fourth overall pick in the 2012 NBA draft. If the Cavaliers weren't going to select Drummond, Irving badly wanted them to consider his close friend, Harrison Barnes. Cleveland passed, and Irving and Waiters have struggled to co-exist together. Before his firing, Grant had started to shop Waiters to teams around the league. There had been discussion on drafting Washington State's Klay Thompson with the fourth overall pick, but Grant believed he could get a deal done later in the lottery and snare him. The Cavaliers missed, Golden State selected Thompson with the 11th pick and he's become one of the best two-way shooting guards in the NBA. Once the Cavaliers won the 2013 draft lottery again, they had come down to two players for the No. 1 overall pick: Anthony Bennett and Ben McLemore, sources said. Again, Indiana's Victor Oladipo was the safest pick, but Grant believed that Oladipo was too much like Waiters. Grant was too stubborn to acknowledge that maybe Waiters' future is as a bench scorer like Jamal Crawford, and Oladipo was the perfect two-way player to complement Irving. 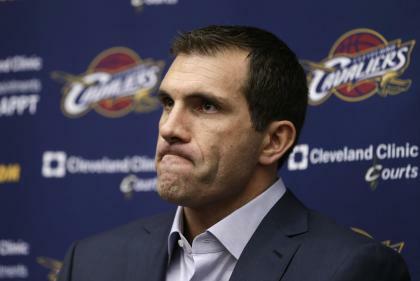 For all those miscalculations, the Cavaliers' constant overselling of the 2013 draft's No. 1 overall pick set the stage for the most colossal of mistakes: taking UNLV's Bennett with the top pick. Bennett's penchant for late-night pizza runs at UNLV, one of the factors contributing to his weight issues, were well known with other teams who had closely researched him. If Cleveland hadn't selected Bennett with the No. 1 overall pick, there was a strong chance that he would've dropped to the back end of the top 10 – or even further. Within hours of the draft, Bennett's agents were calling teams further back in the draft lottery, trying to secure a landing spot for him. Only the Cavs surprised everyone, selecting Bennett – who did have a season-best 19 points and 10 rebounds on Tuesday night – with the first overall pick. Everything the Cavaliers had done until free agency in the summer of 2013 had been to clear hurdles for James' return. After passing on the two best center prospects to come out of the draft in the past several years, Grant made an extraordinary leap of faith on signing free agent Andrew Bynum. After missing an entire season with Philadelphia to chronic knee problems, several teams investigating the signing of Bynum were convinced he had the desire to push through rehabilitation and be a productive player again. But no one made a serious offer to Bynum until Cleveland delivered him a two-year, incentive-laden deal that could've paid him $25 million. The Cavaliers preened, too. Owner Dan Gilbert tweeted, "What's next, C.G.?" Within the league, people wondered: Why are they taking bows? Only Bynum never made it to the early January guarantee date for his full $12.5 million salary in 2013-14, and self-destructed. He stopped trying on the floor, and became a disruptive presence in practices. Before Bynum was thrown out of his final practice and suspended, he was shooting the ball every time he touched it in a practice scrimmage, sources said – from whatever remote part of the court he had caught the ball. In the end, the Cavaliers used Bynum's contract and first-round picks to trade for Chicago's Luol Deng. To keep Deng in free agency this summer, the Cavaliers will probably have to exceed his market value. Letting Deng walk would be too embarrassing, considering how steep a price they paid to acquire him. Deng is a relentlessly positive person, but he hates losing and will be a premium free-agent target for several contending franchises. For now, the Cavaliers are pushing toward next Thursday's trade deadline with Griffin on the phones and a mandate to keep pushing for the playoffs. Cleveland is 19-33, 11th in the Eastern Conference – four games out of the final playoff spot. Three and a half years ago, the Cavaliers lost LeBron James, turned the franchise over to Chris Grant, and now they find themselves still far, far from contention. The NBA's draft lottery is coming again this spring, and it appears the Cleveland Cavaliers will be back where they so boldly vowed they'd never need to return again.